Details of a specimen that are invisible to the naked eye are observed under a microscope before being incorporated into an illustration. 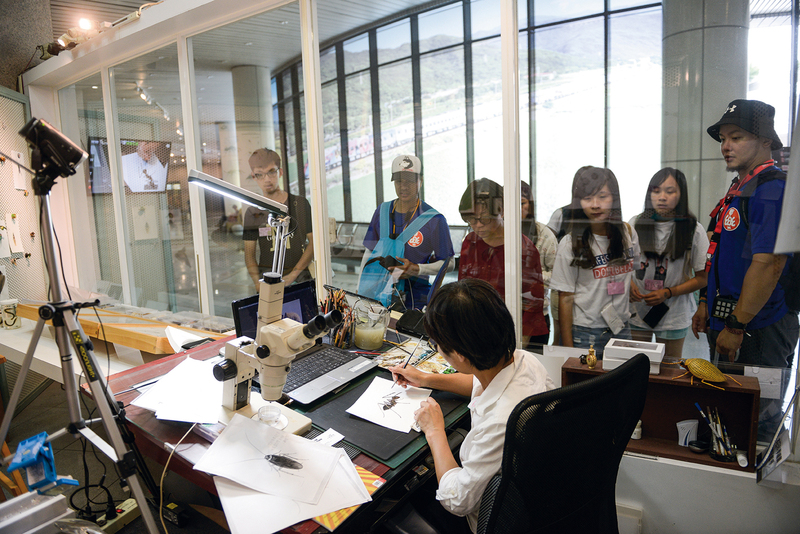 Peng Hsuan Yu concentrates on illustrating a longhorn crazy ant at the scientific illustration exhibition at the National Museum of Natural Science, which has proven popular with visitors. 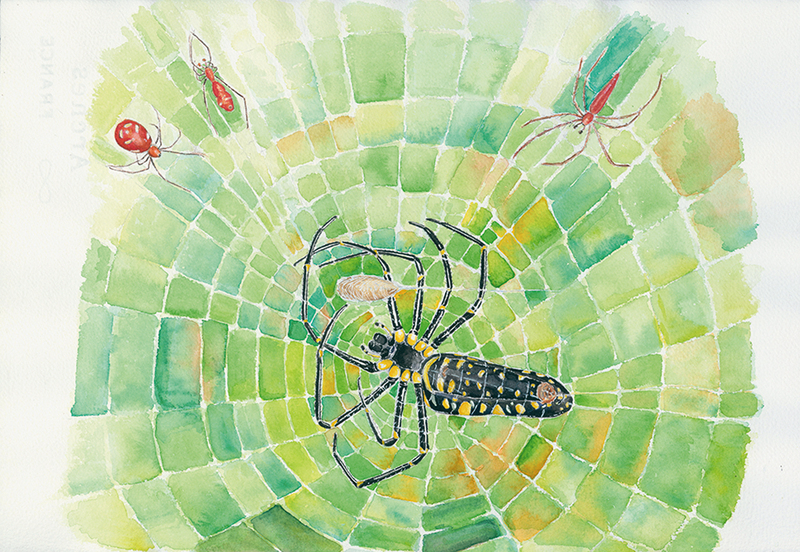 Lau Tak-cheung notes that the essence of scientific illustration is communication. 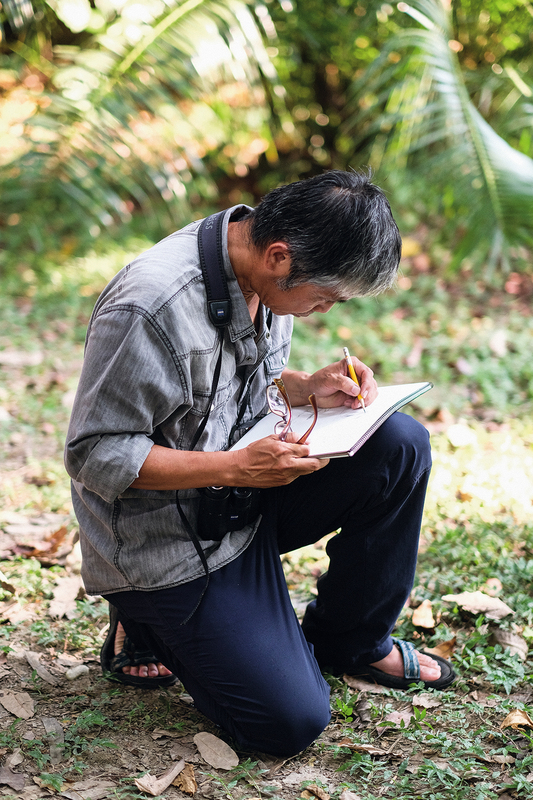 Chen Yi-ming demonstrates his sketching techniques in nature. Working from a photograph, Li Cheng-lin captures the details of a bird’s appearance. Scientific illustration arose in a time before the invention of the camera and allowed scientists to capture the distinctive characteristics of plant and animal species. Armed only with keen powers of observation and an artist’s simple tools, illustrators rendered lifelike images of botanical and zoological specimens. Scientific illustration developed into a unique art form and introduced viewers to the diversity of the natural world. The special exhibition on scientific illustration at the National Museum of Natural Science (NMNS) in Taichung has attracted a lot of attention. In a brightly lit space enclosed behind a glass partition there are many biological specimens on display, as well as an art table on which are the palettes, paints, brushes, and microscope used by illustrators. On the day of our visit, we could also watch as illustrator Peng Hsuan Yu took up her brushes to paint the legs of a longhorn crazy ant in watercolors. Some mesmerized visitors watched with faces glued to the glass, and Peng also interacted with visitors with the help of a microphone. This spectacle is part of the exhibition, and Peng jokingly describes herself as a “living permanent exhibit.” The idea of publicly displaying the behind-the-scenes work of scientific research was the brainchild of Lau Tak-cheung, an associate curator in the museum’s Science Education Department. A long-time advocate of science education, he explains that he drew inspiration from the film industry, where fans love to catch a look at the magic behind the scenes, and he decided to give museum visitors a similar insight into the process and rationale of scientific research. The scientific illustration exhibit has become one of the museum’s most popular. For the last 12 years, the museum has offered scientific illustration seminars and competitions. The seminars allow the public to try their hand at the art and are intended to arouse interest in the sciences. Many phenomena in the natural world are invisible to the naked eye, or a verbal description would be too abstract and cumbersome. Often images can communicate more effectively. “Scientific illustration allows for the transmission of scientific information through images alone,” Lau explains. In fact, communication is the essence of scientific illustration. It is an inclusive term covering a wide variety of artistic techniques, from the realistic images found in field guides to the stipple drawings seen in scientific journals. 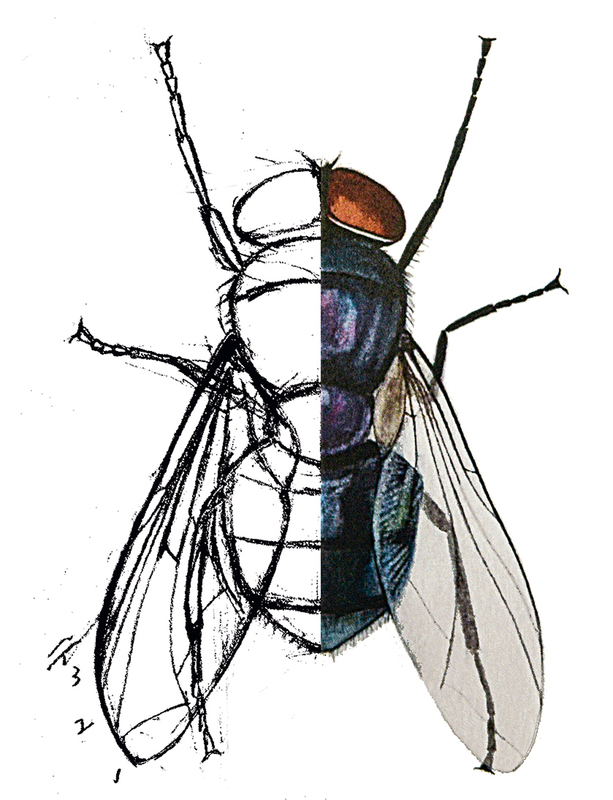 Even cartoon-style illustrations can be considered scientific illustrations. Infographics, widely used today, are also a form of scientific illustration, Lau says. Numerical data are an important part of scientific findings. The challenge is to present those dry statistics through appealing visuals. The first step in scientific illustration is observation, seeing the true nature of things and then depicting them systematically. 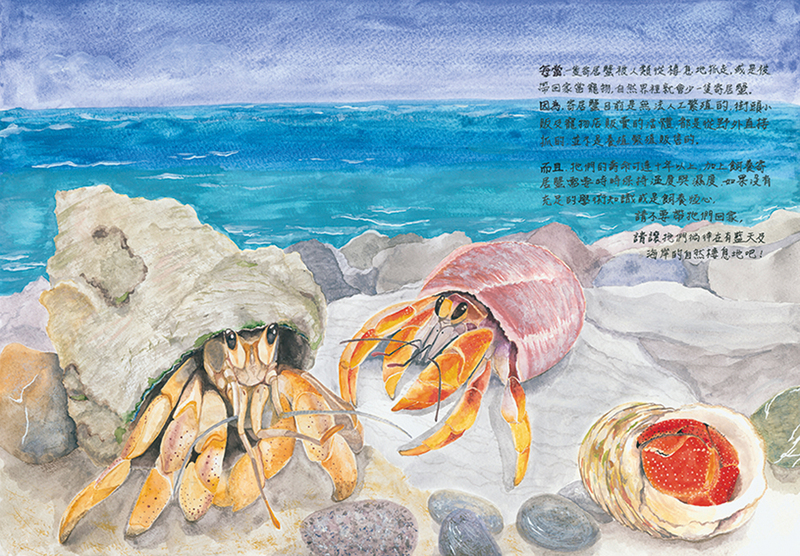 Peng Hsuan Yu’s first assignment as a scientific illustrator was to depict cetaceans—aquatic mammals such as whales and dolphins. She rendered them as rotund animals with full bodies, as she perceived them. But researchers pointed out that her images failed to capture the true shape of the sea creatures. At first she thought the researchers were nitpicking, but her ideas changed with more practice. She realized that the most important factor was accuracy. Careful observation changed her perspective, and love of her work has grown with practice. “Fashion designers love the peacock’s splendor, but few realize the amazing beauty of the colors of a fly,” she says with wonder after having studied flies under a microscope. 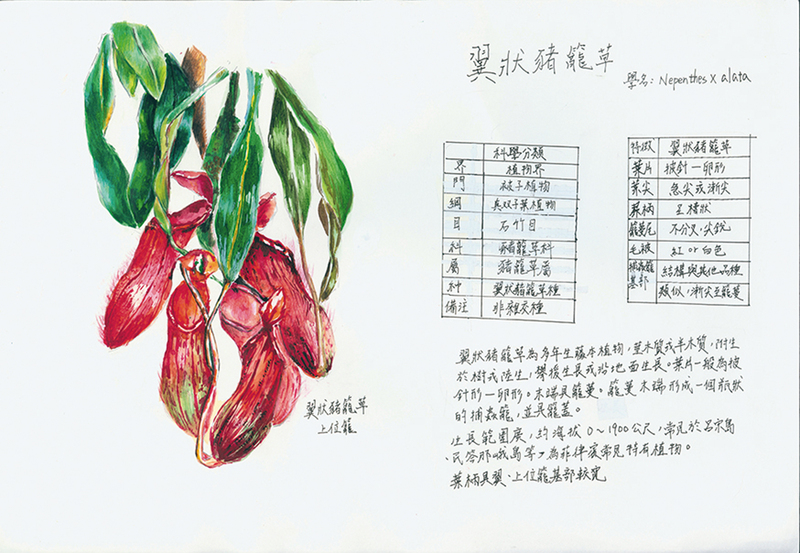 Chen Yi-ming, who works for the Forest Protection Division of the Taiwan Forestry Research Institute, is a pioneer of scientific illustration in Taiwan. He has been engaged in ecological surveys for many years and has considerable field experience. We visited him at the Taipei Botanical Garden, and he gave us a first-hand look at the observation techniques of an illustrator. With a pencil in one hand and a sketchbook in the other, he rapidly sketched the distinctive traits of the head of a bird strolling at a leisurely pace in the park. He then observed the bird’s gait through binoculars and made a quick sketch of its body shape in another corner of the page. Chen explains that in the wild an illustrator must work rapidly, but the appearance and posture of the subject can be captured through quick sketches, providing a reference for later producing detailed illustrations. 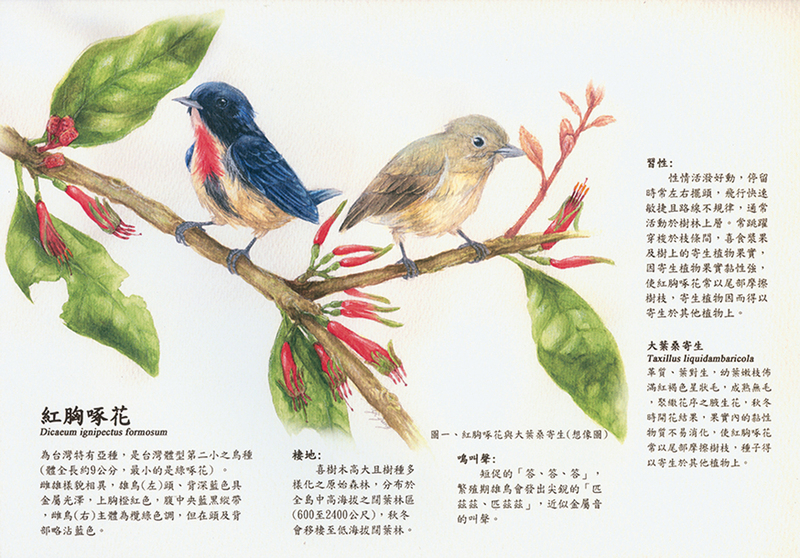 Li Cheng-lin illustrated some 650 bird species for A Field Guide to the Birds of Taiwan (2014), the first Taiwan bird guide to be illustrated entirely by a Taiwanese illustrator. He notes that every bird species has its own character. Ducks and geese are more elegant, with their long S-shaped necks. Some other birds are more skittish, with their alert eyes and wary movements. By including these traits in his illustrations, he captures their unique appearance and personality, their spirit and their vitality. At present Chen is not overly fussy about accuracy in his work. He prefers to capture the vitality of the natural world as he perceives it. Scientific illustration is just a means of expressing his affection and apprehensions for the natural world. A decade ago he created Primitive Taipei, a painting that depicts the Taipei Basin as it might have looked 500 years ago. Capturing a lost ecosystem required him to rely on his imagination while also applying our scientific understanding of the natural world of that day. For the setting he chose the landscape of Shipai, an area in modern Taipei’s Beitou District. He adorned this landscape with the nearly extinct bamboo orchid and the blue lotus, which is thought to be extinct in the wild in Taiwan, along with sika deer foraging in shallow water and otters playing in the wetlands. These are scenes impossible to capture through photography. Chen hopes that this type of imaginative rendering of the natural world will resonate with humanity’s collective unconscious. In this way he hopes to stimulate discussion and contemplation and arouse public interest in the natural world. 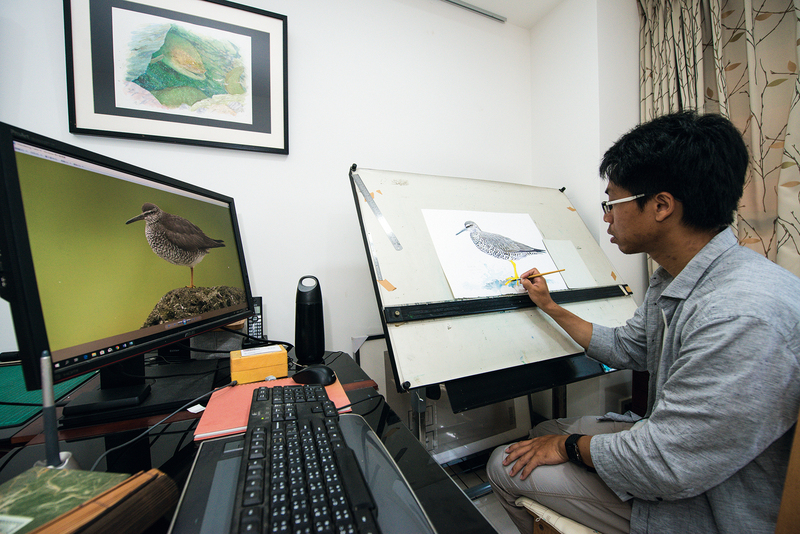 Li Cheng-lin recalls that it took him four and a half years to complete the illustrations for A Field Guide to the Birds of Taiwan. Just as he was beginning the project his mother was diagnosed with cancer, and she passed away six months later. The pain of losing his mother was almost unbearable. It affected his work, and his editor noted that the birds he painted had a sorrowful appearance. 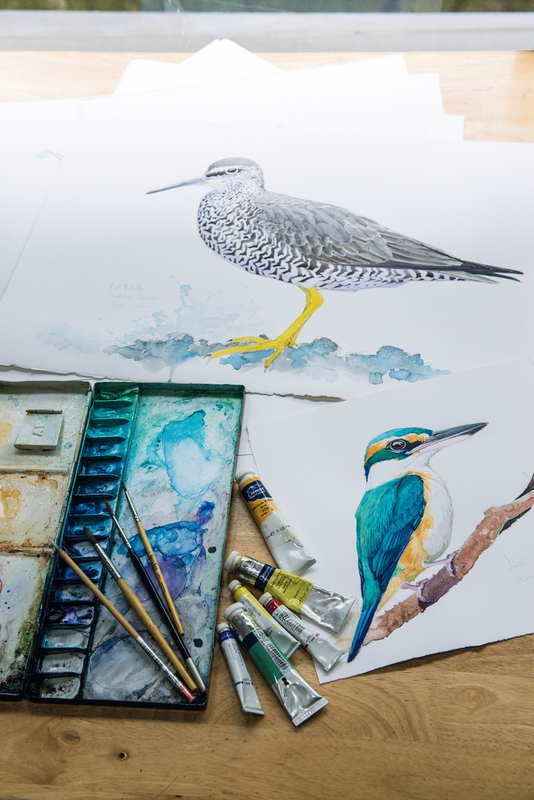 The loss slowed Li’s creative output, but he threw himself into the difficult job of illustrating birds of the sandpiper family (Scolopacidae), which have complex markings and a high degree of similarity. He had to render the differences clearly so that the viewer can easily distinguish between different birds. He learned to divide the bird’s body into different blocks and identify the patterns of each section of plumage. Once this was done, he replicated the results to fill in other parts of the body. Reflecting on these stories while working on his illustrations, Li came to terms with his mother’s passing. He realized that her life’s journey had come to an end, while his work as an illustrator was not yet done. He found a certain tranquility, and the quality of his work improved. 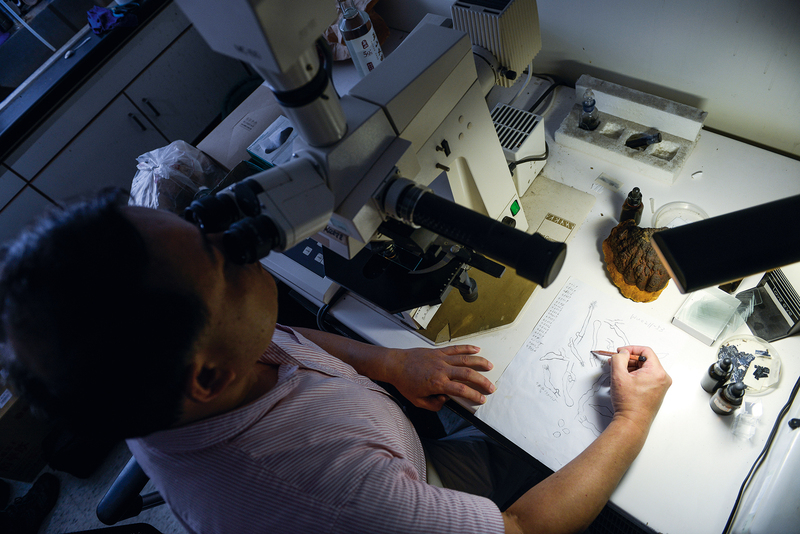 When we met Chen Yi-ming, who is in his sixties, he explained that he has not done traditional scientific illustrations for quite some time because they are time-consuming and hard on the eyes. “But I do what I like to call ‘ecological illustrations,’” he says. As a child Chen loved nature and longed to explore the distant mountains. In college he majored in forestry, and after graduation he began to explore the wilds that had so fascinated him as a youth. For many years now he has participated in ecological fieldwork. He was surprised to find out how much Taiwan’s ecology has changed in a short period. “We all worry about the ecology of the mountain regions, but we didn’t realize that the lowland areas had already changed beyond recognition,” he says. With this change of topic Chen becomes somber. Cement structures have replaced natural riverbanks, and riversides have been converted to parks for human use. Flood control projects have resulted in considerable destruction of aquatic ecosystems and prevented migratory fish from returning. He is saddened to see how these natural landscapes have been transformed to suit human activity. 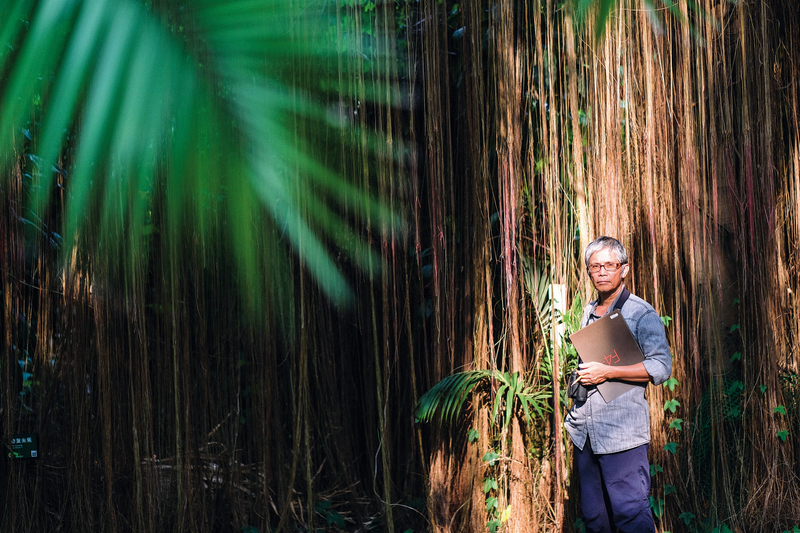 Chen and some likeminded friends have redirected their conservation efforts from Taiwan’s mountains to its coastal plains, where most of the population lives. These illustrators believe they can help people appreciate the beauty of the natural world, learn about the insects, birds and animals that inhabit it, and become more aware of the environmental degradation occurring around us. They hope to use their work to change public attitudes. “This is our most pressing responsibility at present,” says Chen. Li Cheng-lin explains how the idea of an “ecological niche,” which describes the particular role a species may play in an ecosystem, helped lead him to scientific illustration. As a kid, he first wanted to be president and then an astronaut. He even dreamed of becoming a star teacher, inspired by the Japanese manga series Great Teacher Onizaku. But in the end he discovered scientific illustration and settled into the work. Li’s own journey of discovery has inspired him to capture nature’s many marvels through his illustrations. His work allows viewers to see the world from countless angles and interact with it in myriad ways. By providing more diverse ways to understand the natural world, Li is giving viewers the opportunity to discover their own relationship with nature, just as each species finds its unique role in an ecological habitat. Before the advent of cameras, scientific illustration helped people get to know the multifaceted world around them. Today illustrators have taken on the role of educators, striving to enlighten a public estranged from nature about the wonders of biodiversity.